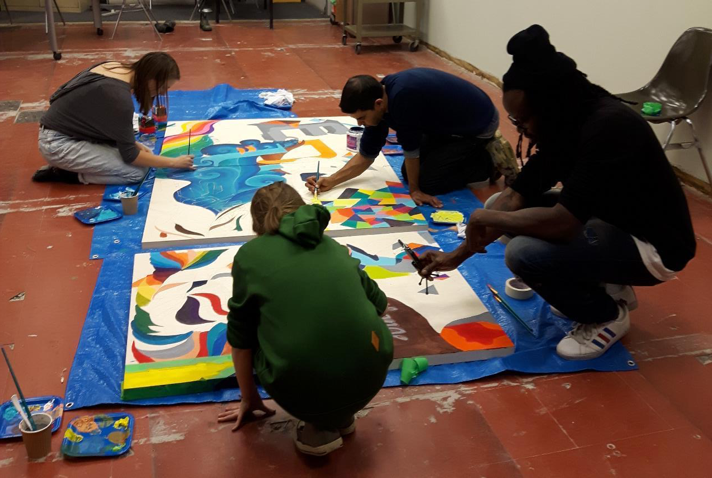 Last year as part of my residency, the P. Lantz Initiative for Excellence in Education and the Arts, faculty from McGill’s Department of Education approached me to design a collaborative mural project for local artists and Montreal youth. 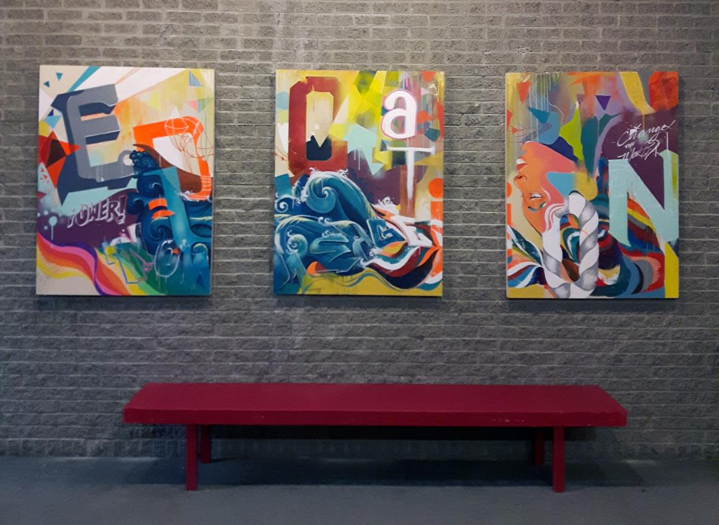 Its objective was to build on existing connections between McGill and other educational sites, develop a learning experience for the participants involved, and create a more lively and colorful environment in the lobby of the education building (3700 McTavish). The idea behind the visual was to create a work of art inspired by graffiti, street art and pop surrealism. We wanted to design a strong imagery and a compelling vibrant visual work using a mix of typography, organic delicate lines and an abstract arrangement mixed with bold strokes and a flowing colourful palette. Under the creative supervision of myself and François Léandre, 7 talented artists committed themselves over a span of 6 weeks (twice a week) to the project: Ariella Racco, Galit Sandeav, Aquil Virani, Chloe Rowan, Michelle Harazny and Maria Ezcurra from McGill (D.I.S.E), Saphir Voyer from Vedun, Emmanuel Akintade from Dawson College,Tatiana Liz Rivera from John Abbott College, Kaiya Gulston from Vanguard School and Alexandre Cambron from le Programme Graffiti Lachine. I am thankful for the artistic liberty that the McGill Department of Education and the P. Lantz Initiative for Excellence in Education and the Arts allowed for this project. I would also like to thank the Department of Integrated Studies in the Arts for helping with the logistic and details.